The first black Greek-letter organization, Alpha Phi Alpha Fraternity, Inc. (Alpha) was founded on the campus of Cornell University in Ithaca, New York on December 4, 1906. Alpha Phi Alpha Fraternity currently has more than 850 chapters around the world and over 185,000 members. 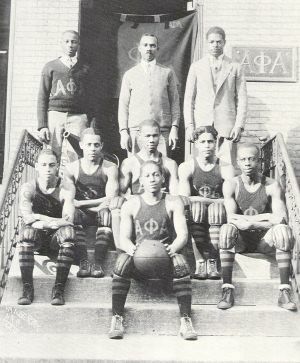 Alpha Phi Alpha was founded by seven undergraduate students at Cornell who were later called by other fraternity members, “The Seven Jewels.” They were Henry Arthur Callis, who was born in 1887 in Rochester, New York, the son of an African Methodist Episcopal (AME) Minister; and Charles Henry Chapman, an older student and cafe owner in Ithaca. Other founders included Eugene Kinkle Jones, the son of a Virginia Union University professor, after graduation would become the first Executive Secretary of the National Urban League; George Biddle Kelley of Troy, New York who later became New York State’s first registered African American civil engineer; and Nathanial Allison Murray, son of the first black employee of the Library of Congress in Washington, D.C. Robert H. Ogle also of Washington, D.C. and the only married member of the founders, later became a staff member of the U.S. Senate Committee on Appropriations. The last of the Jewels was Vertner W. Tandy, the son of a Lexington, Kentucky building contractor who later became the first registered African American architect in New York. Jewel Charles Henry Chapman articulated a founding principle of the fraternity when he said, “We must never lose sight of the fact that we must take part in the development not only of ourselves but of all humanity.” With this vision Alpha Phi Alpha encouraged scholarship, fellowship, good character, and service to humanity. For example, in 1906 when racial tension at Cornell caused many black students to leave the campus, members of the fraternity vowed to continue their education and encouraged other African American students to follow their example. From that point, Alpha Phi Alpha members viewed education as central to the progress of African Americans. They also recognized the need to form a safety network for minority students to encourage one another in their quest for education and in the parallel fight for justice and equality. Alpha’s brotherhood included some of the most influential political figures in African American history including scholar and political activist W.E.B. Dubois, National Association for the Advancement of Colored People (NAACP) attorney Thurgood Marshall who later became the first African American Justice on the Supreme Court of the United States, and Dr. Martin Luther King, Jr., the most prominent 20th Century civil rights activist. The legacy of Dr. King motivated his fraternity brothers to create the Dr. Martin Luther King, Jr. National Memorial Foundation, Inc. The goal of this foundation was to build a memorial in honor of Dr. King’s life and international achievements on the Mall in Washington, D.C. That memorial was completed in 2013. Alpha Phi Alpha’s aims of education, character building, and service to humanity are reflected in its many programs. The College Life to Corporate Life Initiative (C2C) gives its members career opportunities through partnerships built between the fraternity and the corporate world. The Business and Economic Foundation provides impoverished communities the financial means to establish business ventures that aid in the economic development of that neighborhood. Alpha’s Education Foundation continues the goal of the fraternity’s founders to encourage and support African Americans in their efforts to obtain college degrees. It is through these and other programs that Alpha Phi Alpha Fraternity has remained at the forefront of political, economic, and social uplift in the African American community. Alpha Phi Alpha Fraternity, Incorporated, http://www.apa1906.net/; Daniel Soyer, "Fraternities and Sororities," Encyclopedia of African-American Culture and History (New York: Macmillan Library Reference, 1996). York: Macmillan Library Reference, 1996).